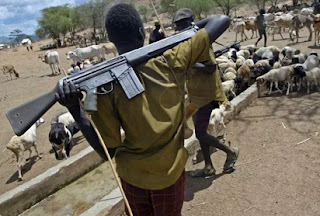 A 22-year-old Fulani herdsman, Abubakar Mojumba has been arrested by Police for the alleged kidnap of a 22-year-old woman Sadiat Musa. He was said to have kept the victim in a thick forest, where he and his gang members raped her serially for three days. Mojumba was one of the 16 suspects paraded by the Oyo State Commissioner of Police, Mr. Abiodun Odude, at the state police headquarters, Eleyele, Ibadan at the week-end. The other 15 suspects were arrested at different parts of the state for armed robbery and theft. Weapons such as guns, cutlasses, local bulletproof jacket, mobile phones, wrist watches, expended cartridges, cars, motorcycles and so on. Odude told journalists that Mojumba, arrested on June 7, 2017, at about 0100hrs, “And others now at large conspired together and kidnapped a 22-year old female victim from her residence at Elewuro Village, Iganna to a thick forest in Iwere-Ile, where she was held hostage for three days and they sexually abused her before she was rescued from her abductors. “While abducting the victim, the hoodlums also stole her husband’s motorcycle with which she was taken away. The suspect was later arrested with the assistance of the villagers while trying to negotiate ransom with victim’s family members”. Mojumba who spoke through an interpreter, confessed that he participated in the illegal operation because his gang members promised to give him motorcycle. According to him, he joined three other persons to carry out the nefarious activity, saying four of them stormed the victim’s house at Elewuro Village, Iganna at Oke Ogun area of the state, robbed the family, abducted the woman and took her to a thick forest on a motorcycle owned by her husband. “Before we left them on that day, we collected the husband’s phone number so that we could negotiate the ransom. “The following day, we went back to the house to drop our phone numbers for easier negotiation. My colleagues promised to give me a motorcycle after the ransom must have been paid. But, now all of them have run away”. Odude also paraded two members of notorious armed robbery gang, Janyu Bello,25, and Aliyu Lawal, 20, that have been terrorising motorists and passengers on Iwere-Ile – Igangan Road, Ado Awaye – Iseyin Road and other places in Oyo State. Also paraded were members of four-man armed robbery gang allegedly responsible for the spate of armed robbery in Akobo, Egbeda, Olodo, Idi Iroko along Olorunda Road, and other places in Ibadan. The gang allegedly robbed 16 houses in three communities on June 3, this year. One of the armed robbery victims, name withheld, narrated her ordeals: “On June 3, 2017, at about 1:15am, the robbers stormed our community. When they came, they asked us to open the gate but we refused. They then broke the fence and cut the iron door. When my husband saw they had cut the lock, he opened the door. “Immediately they entered, they were asking for my husband. When they saw him, they inflicted machete cuts on him. When they said they would kill my husband, I used my hand to shield him from machete and they cut my hand.